Beginning work on Susan Howe is a daunting task because she has garnered so much critical attention. My own scholarship on Howe in this project will focus on one of her most popular texts, A Bibliography of the King’s Book, or, Eikon Basilike, a text that has frequently been the focus of critical scholarship. For the most part, the scholarship on Eikon Basilike has focused on the visual, the historical, and the violent and the ways that these terms intersect in the text. The book works through the dubious authorship of The Eikon Basilike, The Pourtraicture of His Sacred Majestie in his Solitude and Sufferings (a book simultaneously attributed to Charles I and John Gauden, but probably produced by an amalgam of unidentified and unidentifiable authors), as well as Edward Almack’s A Bibliography of the King’s Book; or, Eikon Basilike, which tries in vain to ascertain clear authorship by Charles I. Located on a highly complex and contested site of authorship, Howe’s text negotiates sites of historical documentation, historical violence (by way of Charles I’s execution), and the complex relationship between external “truth” and the visual markers of print. My work will not ignore these issues; indeed, they will surface throughout the following six plateaus. But, I do want to point to the fact that the scholarship on Eikon Basilike, and on Howe’s work more generally, has tended to overlook some important political and poetic issues in favour of repeatedly discussing these concerns. While I will offer a thorough analysis of the literature surrounding Eikon Basilike throughout this section, I would first like to demonstrate this critical oversight by way of the example of Mandy Bloomfield’s 2009 article, “‘Aftershock of Iconoclasm’: Ambivalence of the Visual Page in Susan Howe’s Eikon Basilike,” where this oversight is clearly evident. In this essay, published nearly twenty years after Howe’s Eikon was first printed, Bloomfield crafts a beautiful analysis of the visual disruptions of print in the text, linking this visual prosody to issues of historical accuracy, colonial violence, and the Puritan use of iconoclasm. This congeals in an astute analysis of Eikon’s epigraphic poem that, in the 1989 Paradigm Press edition, appears on an unnumbered page before the falsified frontispiece. In the text’s later inclusion in Howe’s collection The Nonconformist’s Memorial in 1993, this epigraphic poem appears on page fifty-one, with the frontispiece removed. 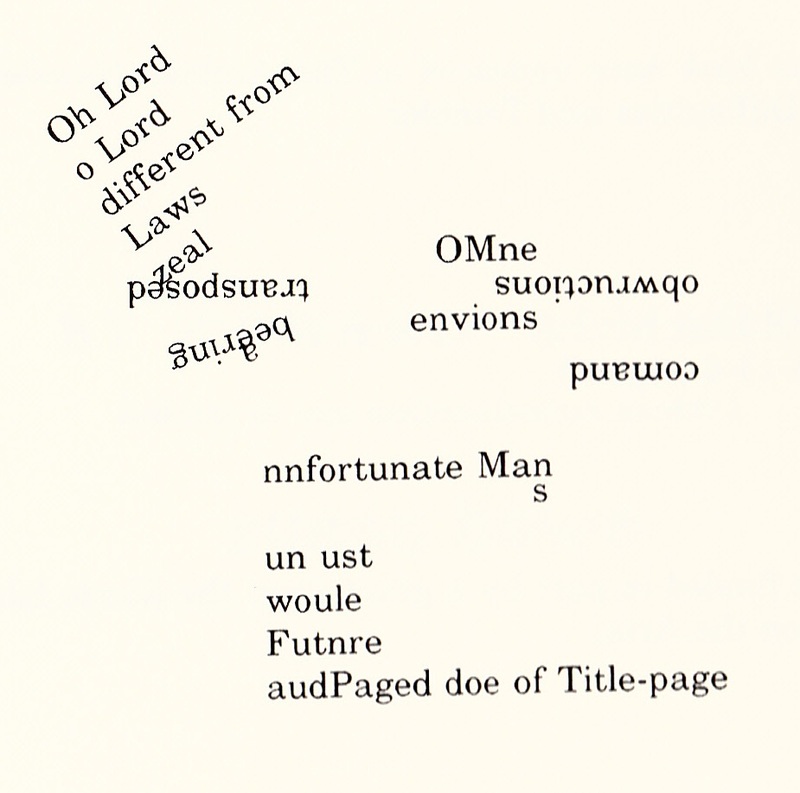 The epigraphic poem initiates the reader immediately into the visual disruptions that permeate the book as a whole; it begins with an askew, nearly toppling-over, “Oh Lord / o Lord” and continues to upturn and erase letters and words throughout. Bloomfield notes that a number of the words on the page would read as complete or nearly complete save for one or two tiny adjustments: “Omne” becomes “O mine” with the addition of the letter “i”; “envions” becomes “envious” when the “n” is flipped over into a “u”; “nnfortunate[i]” offers the same potential fix. While attentive and interested in making observations about Howe’s visual play—which will feature in later discussions on this topic in my own project—it is clear here that Bloomfield overlooks one crucial element of these manipulations: the disrupted letters are, more often than not, “I” and “u,” implicitly destabilizing identity and subjectivity alongside the print grid. I do not mean to suggest here that subjectivity and identity in Howe’s work has been completely critically ignored; I note only that critics have tended to elide these issues in favour of these larger academic trends. One reason for this I might offer is that Marjorie Perloff, almost certainly the most frequently published (and cited) scholar studying Howe’s work, has tended to dominate discussions of Howe’s identity politics. In her 2005 article “Avant-Garde Tradition and Individual Talent: The Case of Language Poetry,” Perloff’s discussions of Howe and subjectivity suggest that despite her insistence on a critical rethinking of individuality and authorship, little has changed in its reception. She laments that “[t]he concept of individual genius, it seems, dies hard” (118), a statement that should read as at least mildly contentious following her most recent book, Unoriginal Genius, and the arguments therein. In an earlier study, “Language Poetry and the Lyric Subject: Ron Silliman’s Albany, Susan Howe’s Buffalo,” Perloff relies heavily on Ron Silliman’s argument that, despite Language Poetry’s call for radically rethinking subjectivity, the revolution of the word is not anarchist because the author chooses words “unilaterally” (431), implicitly supporting a monadic author-subject. Her 1989 study of Howe, however, is much more nuanced, arguing that Howe’s work is rooted in myth/legend rather than the personal (519), and even arguing that her work is not personal or autobiographical at all (520). This latter statement, of course, demands some serious rethinking in light of Howe’s publications over the last two decades. Perloff ultimately argues that Howe’s appropriation of other voices (as in the orgiastic authorship of Charles I’s/Gauden’s/Almack’s/Howe’s Eikon) demonstrates that “Howe’s is never the reduction capsule biography that trivializes” (523). And that in the end, as the French feminists had been maintaining for decades before, the personal is always already political. It is Perloff’s earliest statements that I am most interested in, especially since a line can pretty clearly be drawn between her later characterizations of Howe’s authorship and the critical disinterest that followed. As such, I begin my study of Howe by arguing that Eikon Basilike, a text that begins with the extremely personal and anecdotal description of Howe’s son purchasing Almack’s text at a library sale, actively resists the trivializing biography that Perloff terms. As a result, the text continues a line of ego-disrupting poetic construction that each poet in my project has followed. Kathleen Crown’s “‘This Unstable I-witnessing’: Susan Howe’s Lyric Iconoclasm and the Articulating Ghost,” published in 1998, is one such article that approaches the issues of authorship and subjectivity before Perloff seemed to have her last word on the subject. Crown’s study interrogates the ways in which Howe sees her poems, even those unified in a numberless and narrativeless seriality as Eikon Basilike, as singularities or parts of a multiplicitous whole (485). Crown characterizes Howe’s serial project as anti-telos (486) in a manner not unlike my earlier descriptions of Robert Duncan’s Passages series. Thus, for Crown, the complicated authorship of the text demands a relocation rather than a rejection of authorial agency (489), resurrecting rather than denigrating the radical potentials of the lyric “I” as eye-witness (484). This should, I hope, recall my own musings on Denise Levertov’s assertions on the subject. Crown proposes a radical rethinking of authorship in Howe: a kind of “ecstatic” (488) challenge to a linear view of history and the unity of the lyric subject. My project, in many ways, takes up Crown’s reading of an authorship in Eikon Basilike that hears “voices” (490), a kind of spectral noise that echoes the violence and error of the general scholarship, but one that also acknowledges “language’s agency exceeds one’s control” (493). It is an authorship, a speaking subject that is formed by these voices. That is, “Howe’s acceptance of alterity …seems founded upon her ability to write a language that can transcend the limitation of a single subject position” (134), but, at times her desire to relinquish her self in literature leaves her blind to issues of, for example, privilege, as in what Marsh describes as Howe’s problematic discussion of captivity narratives (135). To avoid the pitfalls Marsh discusses, my work instead follows Gerald L. Bruns, who often discusses issues of anarchism in poetry, who is particular concerned with the ways in which Howe’s work (particular her later work after Eikon) entails a process of “self-formation through the appropriation of the writing (and therefore the subjectivity) of others” (28). Brun’s characterizes Howe’s work, as I have attempted to do above, as one of multiplicitous authorship, an “assemblage of found texts” (42). This process, which he terms “intersubjectivity” to distinguish it from the modernist practice of “intertextuality” (43), is radically anarchic, rendering the author’s name a deleuzoguattarian nom propre. Taking up the seemingly ignored prods of these critics, my work on Howe is interested primarily in those moments of awkward complication when the text directly confronts the issues of unilaterality and genius that Perloff retains even as she condemns them. In the plateaus that follow, I will look toward issues of ecstasy and its relationship to static, to the virtual illegibility of much of Eikon Basilike; I will politicize this polyvocality via the Derridean concept of hauntology, trying to differentiate between the many spectral noises at play; I will interrogate Howe’s physical and intellectual relationship with her readers, who she quite literally seeks to destabilize; and, I will situate Howe’s work in terms of a literary canon, at once problematizing her alignment with the genre of Language Poetry, and proposing instead her inclusion as a kind of concrete poet particularly concerned with textual embodiment. In the end, I hope to demonstrate the ways in which reading Howe’s now canonical text through the lens of postanarchism can let us reinvigorate her work from the categorization and oversimplification that Eikon Basilike has suffered under the detached and often inattentive academic gaze. [i] In the 1989 edition, the word Bloomfield quotes (“nnfortunate”) appears with the two “n”s at its start. When the poem is revised for inclusion in The Nonconformist’s Memorial, however, the first “n” is dropped, leaving the word as “nfortunate,” which loses the first “n”/”u” completely rather than simply missing it. The fact that Bloomfield fails to note this editorial choice demonstrates even further her interest in the generalities of Howe’s wordplay rather than the singular implications. All of this promises to be really exciting! Just a few thoughts, in passing. I wonder if it’s worth drawing a connection between the displaced “u” and “i” in Howe’s work and the eliding of “u are” in the title of Mullen’s S*PeRM**K*T? Or is that too tangential? Also, have I recommended Stephen Collis’s _Through Words of Others_ to you? It’s been a while since I’ve read it (and I don’t have a copy with me) but I think you would find it interesting. He provides an anarcho-syndicalist reading of Howe, if memory serves. In the 3rd paragraph, I think you could expand on your point “that in the end, as the French feminists had been maintaining for decades before, the personal is always already political.” This seems very accurate, but I don’t quite see the transition from the point immediately before it (could you clarify the transition between the points?). Also, at the end of the paragraph, I don’t follow you when you say “actively resists the trivializing biography that Perloff terms” (is there a missing word?). Okay, don’t kick me out of the program for this, but I definitely never realized that the letters missing in S*PeRM**K*T are “u are” — HOLY CRAP!!! I feel like a moron now. It’s worth noting in a footnote though, for sure! I’ve been actually trying to track down a copy of Collis’s book for a while. I caved this morning and bought in on Amazon. So, I hate myself, but I’m excited about the book. Clarifications that you suggest are both good. I think it’s the fact that I was teaching second-wave feminism at the time that led me to lay the hate on the French feminists. I agree that the connection there needs to be more fully developed.